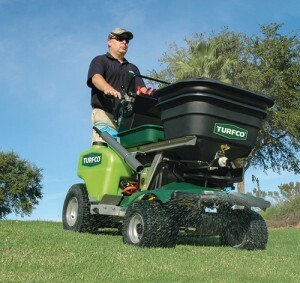 Turfco introduced its T3100 Spreader-Sprayer, which features an enhanced spray system, larger capacity tanks, hands-free speed control and accurate hard trim, says the company. The T3100 has up to a 33-gallon spray capacity and the ability to fit through a 36-in. gate. It includes a combined main tank and optional 3-in-1 tank, which acts an auxiliary tank and allows operators to spray two separate liquids without switching equipment. According to the company, the spreader-sprayer increases spray area from 72,000 to 132,000 sq. ft. The T3100 features a hands-free speed-control pedal, an improved deflector and pump, added guards and rugged axles. It also includes a new spray wand, which offers users more control and better calibration.